I waited until today to do Henry's 9 month update because we had his belated appointment today, two weeks late! 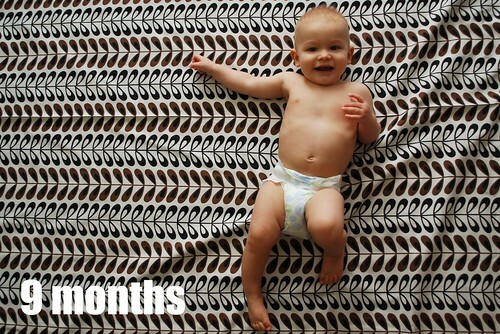 So technically the little guy is half past his 9 month celebration, and on the 22nd he will hit 10 months. This month has been the craziest so far in regards to emerging personality and change. Henry is truly coming into his own, and it's pretty amazing to watch him take shape into the little boy he's going to be. I can't get enough of our dude and I feel like every single day he does something new. It's seriously astonishing to watch him grow and develop, and I'm always so excited to see what he's going to do next. Henry is still the best sleeper, and has been sleeping even more- about 12 to 13 hours a night. He goes to sleep at 6pm, and wakes up anywhere between 6am and 7:30. Most of the time it's right around 6:30am. He's still taking two naps a day. As far as food, he eats three solid meals a day and breastfeeds about 4-5 times. He loves all food, and he's eaten everything from beans to rice, to organic cheese and veggies, organic yogurt, tofu, you name it. 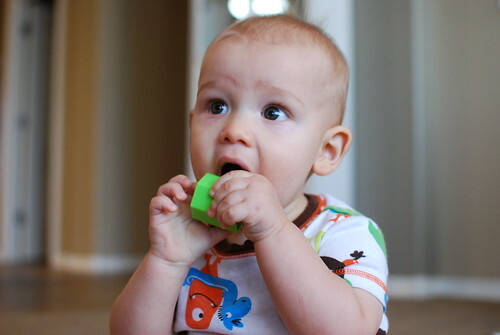 Henry's also getting the hang of feeding himself with his hands, and everyday he gets a little better. 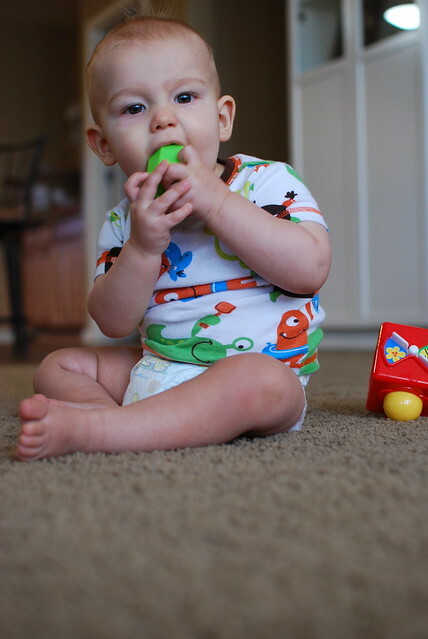 He practices with the Happy Bellies organic puffs and I think those little treats have helped a lot with his hand eye coordination as far as feeding himself. 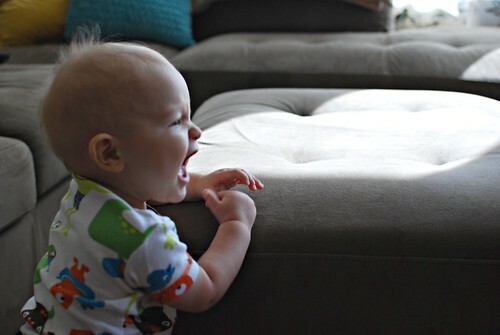 He isn't walking on his own yet, but cruises and walks along furniture and in his walker. 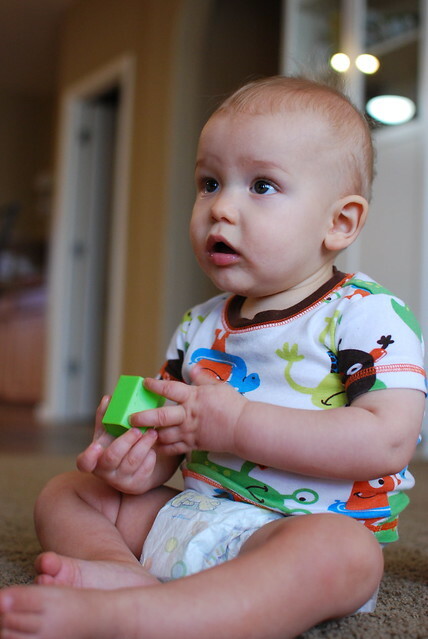 He will also stand on his own, unsupported, for up to about ten seconds. is very ticklish - especially the front of his chest, thighs, and under his arms! still has no teeth but the top two should break through any day! 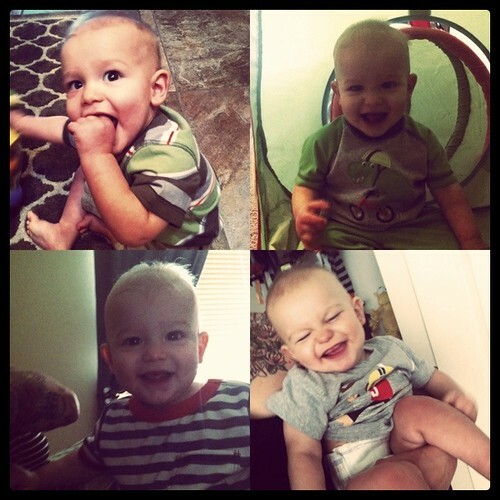 It's really just so hard to believe that he will be one year old so soon! I've started planning his party and that it's itself blows my mind everyday. Man oh man. Happy 9 months Henry, we love you so much! I LOVE the third to last photo (the one of him yelling). My niece still loves to yell and that picture reminds me of her. He's such an adorable boy! Henry has such personality! He is at such a fun age, I miss when my almost four year old was this age! I love having conversations with mine, but this age is just soooo cute! I can't believe it has been over 9 months already! He's just the cutest little guy! So cute! Just wait until he can walk, then it will be almost impossible to take pictures of him! He is adorable! What a cutie!! Target brand diapers are the best! I have an almost 6 month old and seeing all Henry's pictures and developments makes me very excited for what's to come! He just gets cuter and cuter! I love the stage when babies learn to point, I think it is adorable. Incidentally, he weighs the same amount as my doggy! He is getting so big! Enjoy all the tine you can cause it goes by even faster especially once they start school. My son is 13 and I can't belive he will be in High School next year. My little girl Ada was walking at 9 months and it's hard to remeber her as a real 'baby'!! That is one adorable baby. Great update! That last picture is especially darling. 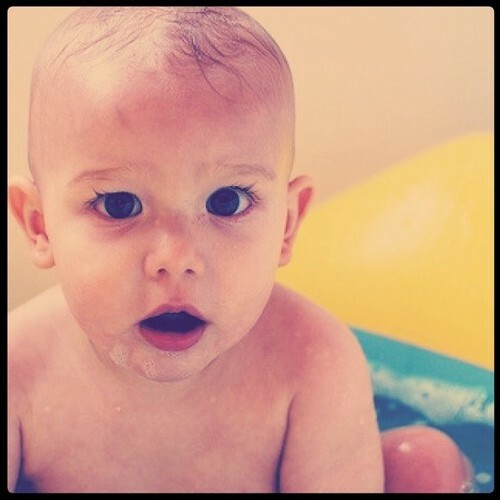 :) Happy 9 months to Henry, I have loved watching him grow over the last couple of months! Aww the half bubble beard picture is the cutest. I love in the 3rd picture, it looks like he has thought bubbles. I wonder what babies think at 9 months? he's such a doll! love his personality! and great choice in books, that was my favorite as well!! he is so cute and so happy!!! I was taking my daughter's 8 month pictures last night. We do ours in a chair! But I keep saying we need to do them laying down because I can't get her to sit still and look at me. I'm not sure which is better, haha! I can't get enough of him! So adorable! i love that last collage! so adorbz. Such a sweet boy! Makes me miss having a baby around! He's just perfect. He is such a little monkey. Thanks for sharing all the info. It's fun to see where my daughter's at! Wow - it really is incredible. I feel like it was just yesterday that you brought him home! Gosh, he is just too cute! My daughter LOVES the Very Hungry Caterpillar too! Growing up so fast! What a cutie. his hair is soooooo light? is it going blond? How did you get Henry to sleep 12 - 13 hours a night? We are struggling with sleep for my 10 month old. ANy tips would be appreciated!